As a nurse practitioner (NP), you can work alone or collaborate with physicians and other medical professionals to provide the best possible care for your patient. This includes assessing patients’ health, diagnosing, ordering and interpreting medical tests, and creating and implementing treatment plans. Having a career as a family nurse practitioner (FNP), much like a primary care/family physician, gives you the opportunity to work with your patients for their entire lives. Feel free to click through the links below or read on to learn more about becoming an FNP. Are there online FNP degree programs? You can work your way toward becoming an FNP through either a traditional or online accredited degree program. Online programs are beneficial because they are often more cost-effective, and allow you to have more flexibility with your schedule. For those who have families or are currently working, online FNP degree programs can be a far more convenient option. An FNP falls under the advanced practice registered nurse (APRN) umbrella. Before you become an APRN, you need to be a RN (registered nurse) first. The following five steps explain how you can become a RN, APRN, and finally an FNP, resulting in nursing licensure and experience, a master’s of science in nursing, and board certification. You need to become a RN before you can become an FNP, and your first step in doing so is to obtain your BSN from an accredited program. Students may choose to obtain a nursing associate degree before pursuing a BSN. Whether you get your associates first or go straight into a baccalaureate program, it will typically take you around four years to complete. Some colleges and universities offer other types of bridge programs that allow students to with an associate degree to go directly into a master’s in nursing (MSN) program. These programs usually take about five years to complete. How much time it takes you to complete any program depends on if you are a full-time or part-time student and the structure of the degree program. You must have a license to legally work as a nurse in the United States. Once you have graduated from your bachelor degree program, you will study for the National Council Licensure Examination for Registered Nurses (NCLEX-RN). This is a nationally recognized exam that is administered at approved testing centers in every state. Once you have passed the NCLEX-RN, you will be a licensed RN. Some states have additional certifications that they require in order for you to become a licensed RN. Most programs require one – two years of field work before accepting students into a family nurse practitioner (FNP) program. This is to ensure that your RN license is active and for you to demonstrate that you can accurately apply what you learned during your undergrad. Prospective graduate programs will then be able to see that you are capable of successfully interacting with patients and functioning efficiently in a professional medical setting. Registered nurses wear many hats and this hands-on experience will give you a taste of the types of patients and cases you’ll come across working as an FNP. Once you have completed the previous steps and passed the Graduate Record Examination (GRE) with a sufficient score, you can enroll in a graduate-level nursing program with a family nurse practitioner concentration. Accredited FNP programs typically take about two years to complete and requires students to complete both classroom and clinical hours. We will go into more detail of what to expect in an FNP program later on. After you have graduated from a masters-level FNP program, you are eligible to become a Certified Family Nurse Practitioner (CFNP). FNP certification is offered by two separate governing boards, the American Nurses Credentialing Center (ANCC) and the American Association of Nurse Practitioners (AANP). It is important to note that you only need certification from one of these boards. Whichever board you choose, know that you’ll need to renew your certification every 5 years with continuing education courses. Any FNP program you’re looking into should be approved and have accreditation from a nationally recognized accreditation board. Graduating from an accredited program informs your future employers that you received a well-rounded and standard nursing education. As previously mentioned, a MSN in FNP can take about two years to complete and consists of both classroom and clinical hours. An FNP master’s degree program will delve further into the subjects taught during your undergrad, cover additional material specific to working as an FNP, and teach you how to apply it all in a professional setting. There will also likely be several courses dedicated to the primary care of specific patient populations such as children, women’s health, geriatrics, and patients with complex issues. As an aspiring APRN, there are several degree and career paths for you to choose from if you decide not to pursue an FNP degree. The list below includes brief descriptions of the more popular nursing degree options. Feel free to click on each of the links to learn even more about the individual degree programs. Master’s of Science in Nursing (MSN) Programs – Without any concentration, this general nursing degree program will allow you to become an Advanced Practice Registered Nurse (APRN). Once you have graduated from this program, you can also choose to continue your education to earn a DNP. Adult Health Programs – This degree program will teach you about health concerns in adult and geriatric populations. You’ll learn how to diagnose and manage your patients’ health throughout their adult lives. Gerontology Programs – In this degree program, you’ll focus on the primary care of an elderly population. A gerontology program can teach you how to diagnose and treat cardiovascular, neurological, and sensory/pain issues, which are common healthcare concerns of this demographic. Women’s Health/Midwifery Programs – Focusing your education on women’s health or nurse-midwifery gives you the opportunity administer primary care to women at all ages, and you’ll learn how to manage women’s obstetrical and gynecological needs and the healthcare of a newborn. Doctor of Nursing Practice (DNP) Programs – A DNP degree is the highest level of clinical nursing education that you can receive. This degree will allow you to be leader in clinical nursing and be at the forefront of nursing research, education, policies, and/or administration. The APRN field is booming and is projected to grow 31% from 2014-2024, which is far higher than the average, 7% increase, of all occupations. This growth is largely due to society’s growing awareness of the importance of preventative care and more people with health insurance. It’s no secret that family and other nurse practitioners are needed all over the country. The Bureau of Labor Statistics (BLS) map below illustrates the states with the highest employment level in the darkest shade of green. 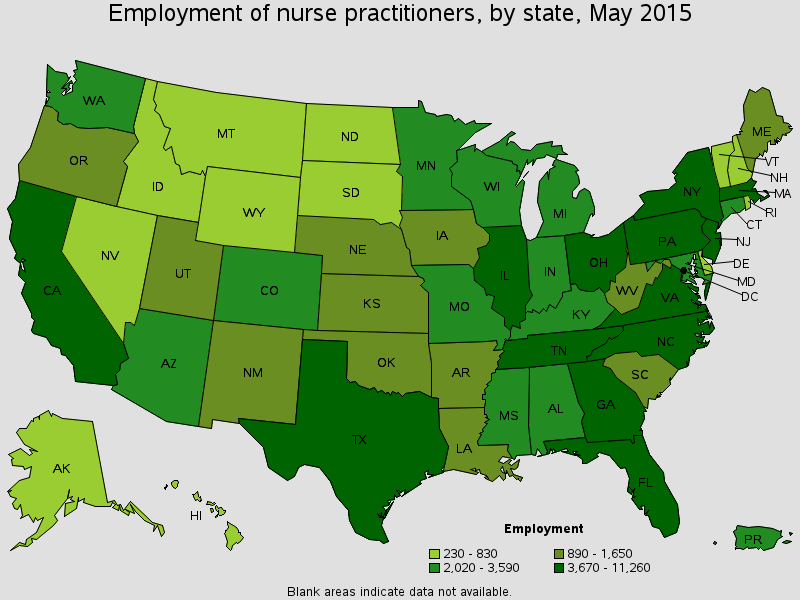 The top five nurse practitioner employment states according to the BLS are New York, California, Florida, Texas, and Ohio. A nursing education and career is filled with a multitude of choices and opportunities to help people. As a family nurse practitioner, you’ll be able to develop relationships with your patients and help them stay healthy throughout their entire lives. Explore the rest of our website to discover how you can get your start as an FNP. A: About 6 years, requiring you to obtain a BSN, MSN, and in many cases an RN license.